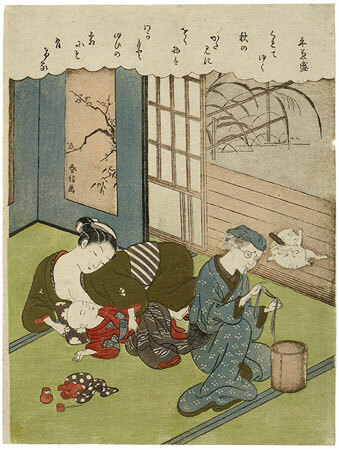 The right figure of the old woman kneeling by a wooden box from which she is drawing lengths of thread is taken directly from a book by Nishikawa Sukenobu, on the occupations of women, entitled Hyakunin Jorō Shinasadame. Harunobu’s use of the figure is this tranquil and poetic scene is a fine example of the sense of transformation that lies at the heart of ukiyo-e and so much other Japanese art. That these intense colours were intended by Harunobu and were typical of the late 1760s is shown by the fact that a second state of the print, with the poem removed, and the old woman’s face reengraved is known, printed with colour typical of the early 1770s, notably the orange which is so prominent in the work of Koryūsai. An impression of this late state is in the Musées Royaux d’Art et d’Histoire in Brussels. Reproduced in Riese, Asiatische Studien, 1972, p. 85, no. 11.